Of u nu een toerist bent of een zakelijke reiziger, Aroma Beach Resort and Spa is een uitstekende accommodatie tijdens een bezoek aan Phan Thiet. Het hotel ligt slechts 9 km van het stadscentrum: lokale bezienswaardigheden zijn dus snel te bereiken. Een baken van rust en ontspanning: dit hotel is het perfecte verblijf op steenworp afstand van bezienswaardigheden als Bai Da Ong Dia, Sea Link Golf Course, Ponashu Toren. Het Aroma Beach Resort and Spa biedt gasten superieure dienstverlening plus een breed scala aan voorzieningen en is toegewijd om uw verblijf zo comfortabel als mogelijk te maken. Terwijl u verblijft in deze geweldige accommodatie, geniet u van faciliteiten als gratis wi-fi in alle kamers, 24-uur receptie, snel in- en uitchecken, bagageopslag, wi-fi in openbare ruimtes. Het hotel heeft 52 prachtig ingerichte kamers voor gasten, elk met plasma tv, kledingrek, spiegel, handdoeken, internet (draadloos). Het hotel biedt fantastische faciliteiten, inclusief hot tub, privéstrand, fitnesscentrum, zwembad (buiten), wellnessfaciliteiten, zodat u kunt onthaasten na een bezige dag in de stad. 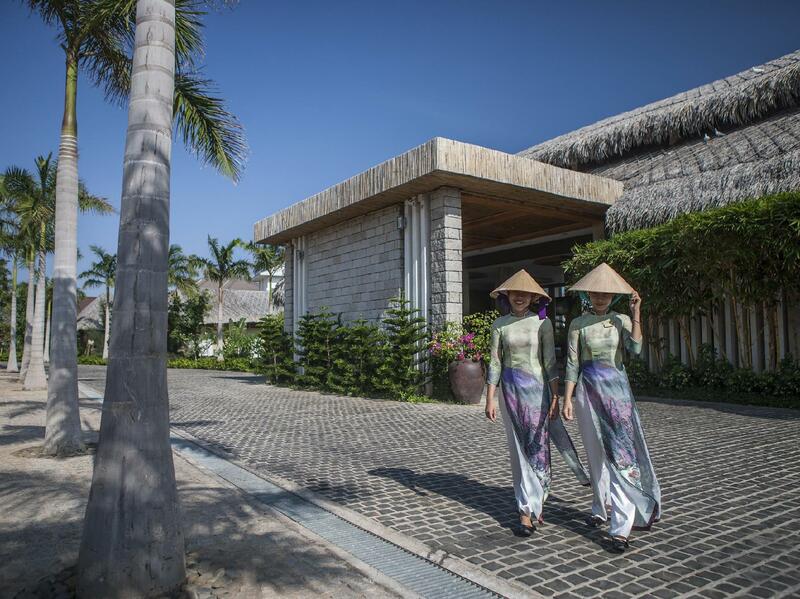 Fantastische faciliteiten en een uitstekende locatie maken het Aroma Beach Resort and Spa de perfecte uitvalsbasis om van uw verblijf in Phan Thiet te genieten. Children 0 -4 years old stay for free if using existing bed. Children 5 - 10 years old will be charged USD 9 when using existing bed. Heerlijk verbleven on te relaxen. Goede en snelle service ten alle tijden. Iets buiten phab thiet dus duurt een kleine tijd voordat je bij de winkeltjes en restaurantjes bent. Zalig, heerlijk kunnen ontspannen. Het resort was doordeweeks rustig. Mooi ligging en je merkt dat het een nieuw resort is. Staff kan goed Engels en hulp bereid ten alle tijden. This was my second trip to Mui Ne and I could not be happier with our choice of hotel this time around. 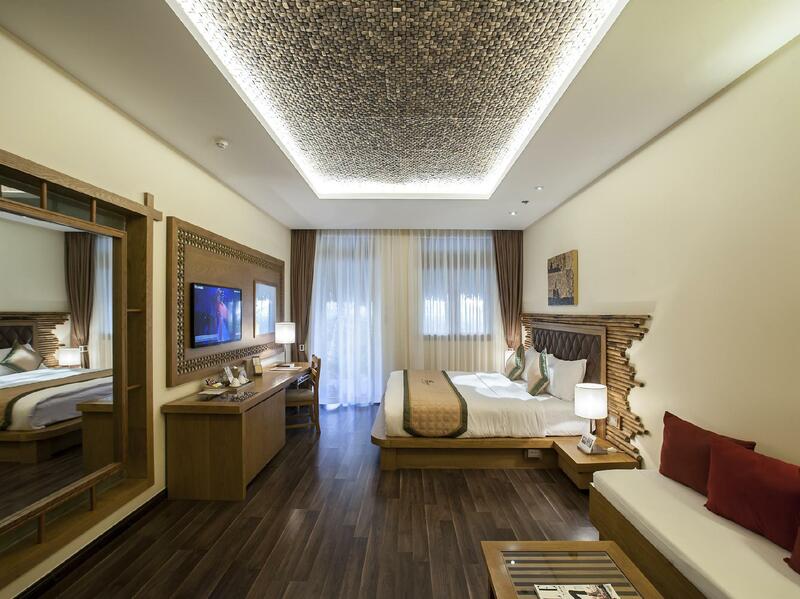 The rooms are spacious, modern, and very comfortable. The hotel food is actually good and the beach is well maintained. Nice pool facilities too. At this price point you won't find better. From a negative standpoint, I can point out the massive bathtubs cannot be used due to insufficient hot water, I'm afraid. On a positive note, you should stay here for the staff...all of them. I was always greeted with a smile from everyone who worked there. I must especially commend the front desk staff for helping to retrieve my bank card from the ATM adjacent to the property, delivered straight to the lobby. Simply amazing! As for location, one should be aware this beach is 5-10 km from town...exactly why I choose to stay in this area. Aroma Beach Resort is the only place on this beach with an ATM next to the entrance, a convenience store across the street, and a little restaurant. My first time to this Resort with high expectations. Aroma did not disappoint. Impressed with service, grounds and general set out, large room spotlessly cleaned and food of a high standard and helpful staff. A totally enjoyable stay. The first room they checked us in had malfunction air-con. We called receptionist and they sent technician in but the air-con couldn't be fixed. We requested to move to another room and the attitude of the service staff who helped us to move was very bad. 9 reizigers vonden deze beoordeling nuttig. Wat vond u? Very good. Rooms are excellent. Friendly Staff. Romantic feeling. Good breakfast included, but all dishes we got were top. Would surely go back again. And also a very nice swimming pool. One word: excellent!! Just a super nice resort! Great beds and nice bath! We love staying here! 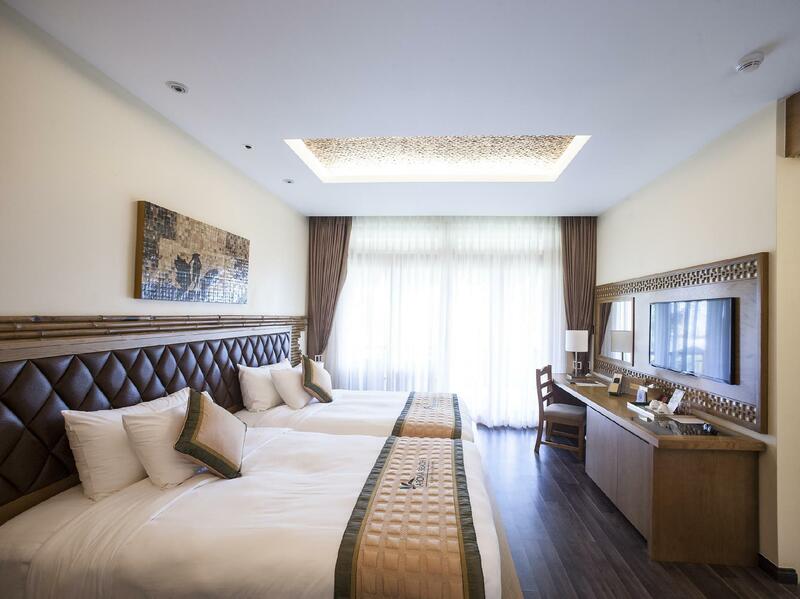 Nice room, large swimming pool, clean and quite place, friendly staffs! Breakfast is as good as expected. The only thing i dont like is that the bathtub in bathroom was too big that you could not wait to fill it full. Definitely Would come back here! The outside is quite good, but they closed the bar, and also the restaurant is nice, they insist we only can check in at 2:00pm, but there are some customers check in before 2:00pm, it’s quite disappointed, because of the delay of the spa service, so we requested check out at 12:30pm, they also refused our requests, should consider more choice if u want to book this hotel. 12 reizigers vonden deze beoordeling nuttig. Wat vond u? Eco-oriented design in fresh air. Very good in rate. Better improving illumination. Phòng rất rộng rãi và đẹp, duy chỉ thiếu vòi xit ở bồn cầu nên hơi bất tiện. Bãi biển sạch, có kè đá nên só ng biển cũng êm. đồ ăn sang hơi ít món và đơn điệu. We travelled as an extended families with small children. The rooms were clean and spacious. We requested extra towels and vanity kits, which the staff happily and timely provided. The breakfast buffet was sufficiently presented with a wide selection of hot food and sweets. The garden has reasonably good playground for kids. The kids enjoyed the swimming pool, while adults enjoyed the beach. 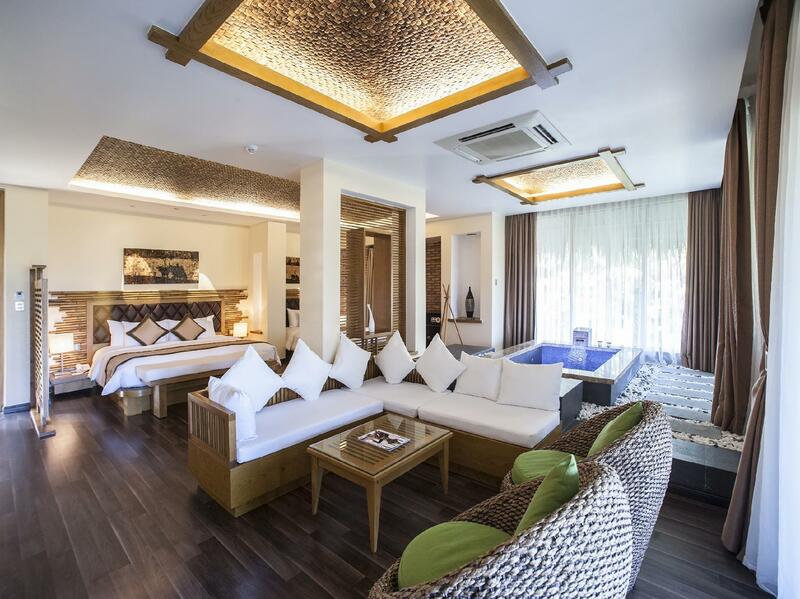 We would recommend Aroma Beach to families or group travellers who are looking for a nice boutique spa & resort for a mini get-away trip in Mui Ne. The resort is located beach front (although the beach is not very clean, but litters are a common sight in Muine), with nice swimming pool. The whole resort design is very nice and well maintained, surrounding is rather serene. Breakfast and food selection at the restaurant is satisfactory. 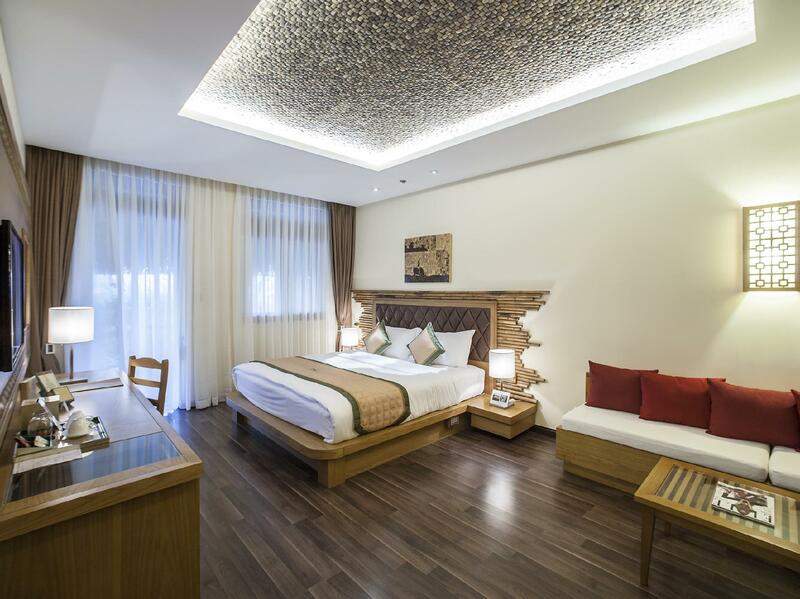 The room design (we had the room with indoor Jacuzzi), is very spacious and clean, well maintained. Generally, it is a good experience with this resort. Okay trip, nice room, nice location but things need to improve : - the beach was under reconstruction, we could not have a swim, if U travel by next week which it will be finished, hopefully the beach will be nice. - breakfast food need more quality, more choices please -carefuly using the low quality hotel umbrella, eventhough we used it carefully but ended up broken slightly but staff asked us to buy it. We were not happy at all. Other than that, good quite place. Recommend to stay when the beach is improved and better food choices. super clean, spacious and great garden! Really love the spacious room! 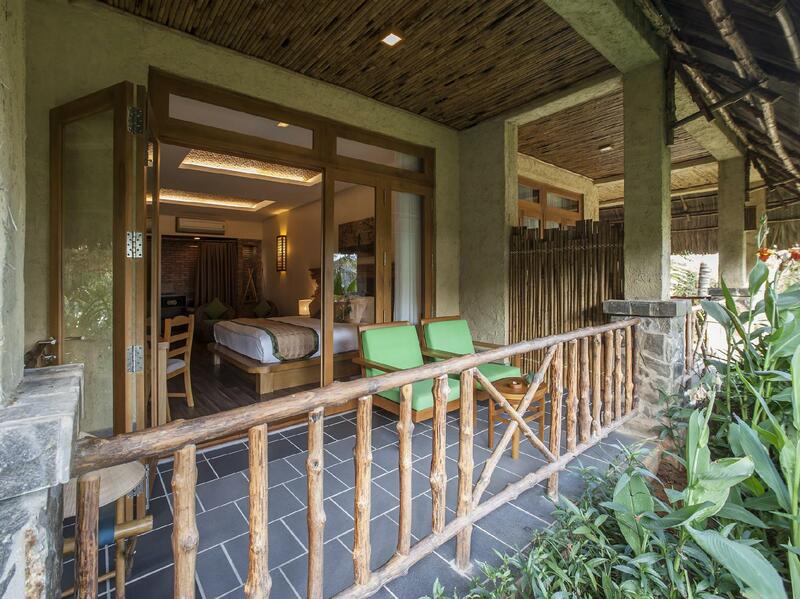 we'd stay for one night in Triple Villa, the room was great and very well decorated. Though the beach is not suitable for swimming, the view was stunning! We spend our morning swimming and sun bathing at the pool area. Must try the SPA too! Since I was travelling myself and looking for quiet and peaceful weekend getaway, and this place turned out be the best choice. Independenct villa with eco-friendly decoration which is mainly designed with woods and stones, provided me relaxation and feeling being in the nature. Also, even though the villas was fully booked, it was so quiet and was not disturbed by anyone. Swimming pool and the scenery from the restaurant is awesome and had great time there. Unfortunately, I was suffered from severe fear and chill for the last 2 days because of the sudden change of weather and fatigue i assumed and then the manager and the staff of the resort took extra care of me which I was really appreciated and got better the day took off to HCMC. I would definitely recommand this resort for whom want to travel Phan Tiet and have true relaxation and enjoy the moment. The most comfortable beds in SE Asia. The staff are there for anything you need, polite and courteous. Impeccable grounds, perfectly maintained. Beautiful views of ocean and pool. A perfect relaxing holiday, no need to go anywhere else.